U.S. Hands Off Syria! – No War! All Out Saturday, Sept. 7, Boston! A U.S. attack on Syria is imminent as the Obama administration presses Congress to approve a war that the American people and the whole world rejects. They say it is a limited punitive “surgical strike” against Syrian President Bashar al-Assad for his alleged use of chemical weapons. Make no mistake, any military intervention will be a war against the Syrian people. To date, neither the U.S. or anyone else has presented credible proof of the use of Sarin gas by the Syrian government, the current pretext for yet another war. We certainly know the U.S. government is capable of manufacturing “evidence”, as they did with WMD’s in Iraq, so we should remain skeptical. More importantly, the U.S. has no political, legal or moral standing to use force against any nation. The warmaking would-be cop of the world has an unbroken record of military interventions that have murdered millions to advance the interests of the ONE PERCENT. In fact, the U.S. has used and/or supported the use of biological and chemical warfare all over the world, and uses and manufactures these and many other weapons, equally horrific. With yet another war imminent, all antiwar and social justice activists must assume a mobilization footing and challenge the warmakers in the administration and in Congress on a daily basis. Protests and campaigns to demand that Congress votes against war are planned across the country and indeed, around the world. All out to oppose any U.S. attack on Syria! We stand for peace! read more including IAC Statement..
Last week there were demonstrations and rallies against bombing Syria in at least 48 U.S. cities. This Saturday, the 1:00 PM Times Square demonstration will be one of dozens across the country. OnMonday, September 9, as Congress goes back into session, the Syrian American Forum and others will protest in front of the White House, then march to the U.S. Congress. The cost of wars in Iraq and Afghanistan exceeds $4 trillion dollars. The cruise missiles the US is planning to fire at Syria cost $1.5 million apiece. The profits of the missile’s maker, Raytheon, may be soaring -- but our cities are crumbling. People are hurting from joblessness, foreclosures, sequester cuts and furloughs. Hospitals and schools are closing. War propaganda always accompanies war. In 2003 before the attack on Iraq, it was “weapons of mass destruction.” In 1991 in the first Gulf War it was “incubator babies.” In Vietnam it was U.S. ships being fired on in the Gulf of Tonkin. It’s ludicrous to think that the Assad regime used chemical weapons on the same day weapons inspectors arrived in Syria. The inspectors were less than ten miles away from the attack and had been invited by the Syrian government. But even if the Syrian government did it, the U.S. is the last country on earth that should start a war on the basis of combatting war crimes. The Pentagon’s 2004 assault on the city of Fallujah alone left the residents there with staggering rates of cancer, birth defects and infant mortality due to the U.S. military’s use of depleted uranium and white phosphorus. Just last month the recipient of $1.5 billion in annual military aid, the Egyptian government, brutally cleared the streets of protest encampments that included men, women and children. By far, the world’s largest stockpile of chemical, nuclear and every other kind of weapon belongs to the United States -- the only country to have used nuclear weapons on civilians. We don't want another war for the 1%. The rich will win and the people in the U.S., Syria and the entire Middle East region will lose. Hands off Syria! Syrian American Forum CALLS FOR A MARCH ON WASHINGTON D.C. Endorse, Volunteer for or List Local 9-7-13 HANDS OFF SYRIA Action! GET ON THE BOSTON-PROVIDENCE BUS TO THE 2013 POOR PEOPLES CAMPAIGN MARCH FROM BALTIMORE TO WASHINGTON! 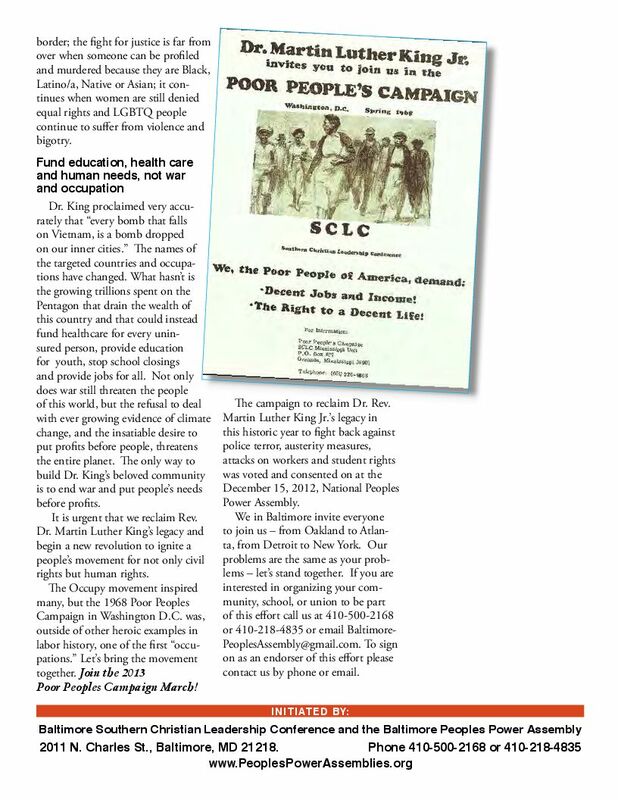 HEAR THE PLANS FOR THE POOR PEOPLES CAMPAIGN! HELP PLAN OUTREACH TO FILL THE BUS! We can no longer be divided from or consider a person as "illegal” simply because he or she has crossed a border; the fight for justice is far from over when someone can be profiled and murdered because they are Black, Latino/a, Native or Asian; it continues when women are still denied equal rights and LGBTQ people continue to suffer from violence and bigotry. We in Baltimore invite everyone to join us – from Oakland to Atlanta, from Detroit to New York. Our problems are the same as your problems – let’s stand together. If you are interested in organizing your community, school, or union to be part of this effort call us at 410-500-2168 or 410-218-4835 or emailBaltimorePeoplesAssembly@gmail.com. To sign on as an endorser of this effort please contact us by phone or email. 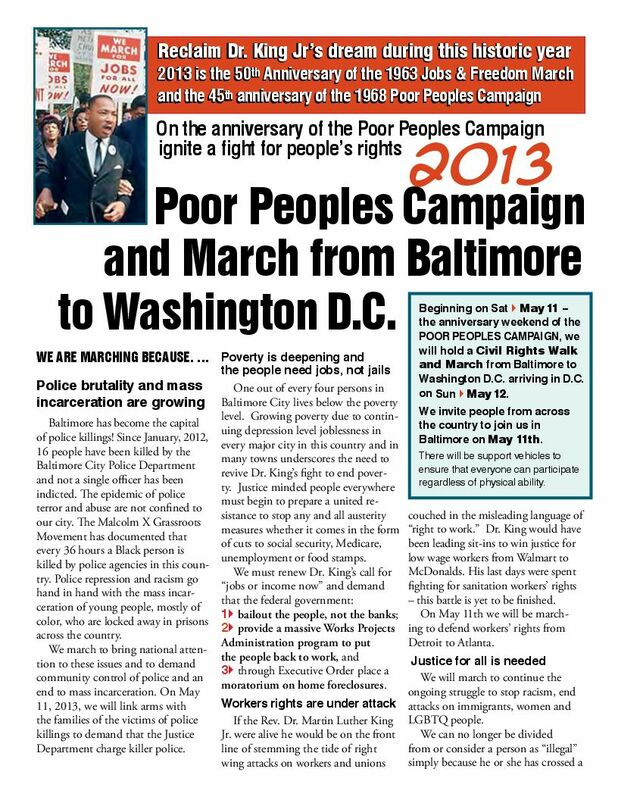 FRIDAY, MAY 10 -- 5:00 P.M. Pre-Poor People’s March Kick-off in the Community at Biddle Street and North Montford Avenue, 21213 – Join us from 5 P.M. to 9:30 P.M. Remember Anthony Anderson Sr. with family members. Hot dogs and refreshments! We will be putting together signs and listening to spoken word artists and singers. We’ll open up the People’s Power Assembly with a community speak-out, and showing videos as it gets dark. We will also canvas the neighborhood. SATURDAY, MAY 11 -- 10 A.M. 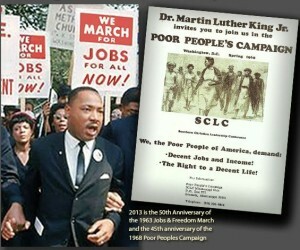 The Poor People’s Campaign March rally begins. The March will start at 11 A.M. sharp. We will gather in the lot where Anthony Anderson Sr. was killed by Baltimore Police. This is one of the poorest communities in Baltimore. At a brief rally, we will recognize all who have come. Several key things to be aware of: There will be support vehicles, vans, and cars, so there will be options. Some people may choose to ride the entire route. Most will take breaks and alternate between walking and riding. Some participants will also have to drive. For those activists who view the 41-mile march itself as very important, we are making it possible for them to walk the entire route. From our own experience and that of others who have done this, the key is unity, a lot of spirit, group decision--making and lots of water. Uphold the Legacy of Women's Resistance! No war on Iran!| Boycott Israel! Speakout and then march to Park St. Right now, people of conscience from Asia, Africa and Europe are headed to Jerusalem to stand in solidarity with Palestinians suffering under Israeli apartheid and colonialism. The historic day 30th March marks Palestine Land Day in Palestinian national memory. The march’s aim is to mark it as an international event to demonstrate solidarity with Palestinians and to protect Jerusalem. The march will demand freedom for Jerusalem and its people and to put an end to the Apartheid, ethnic cleansing and policies affecting the people, land and sanctity of Jerusalem. Since 1948, Israel has steadily eaten away at Palestinian communities and replaced them with Israeli colonial entities.To this very day, Israel expels Palestinians from their homes, demolishes homes, and colonizes whole neighborhoods. East Jerusalem is under attack from right wing settlers supported and protected by the government. It is slow but steady ethnic cleansing. Join us in Boston to stand in solidarity with this global effort to bring justice to Palestine and to end US and Israeli aggression against Iran. invites you to join us for …. Uphold the Legacy of Women’s Resistance!!! Stop the War on Women at Home and Abroad! Bail out Women and Our Communities, Not the Banks! We Demand Justice for Trayvon Martin, his family and community! JOBS with Union Wages or a Livable Income for All! 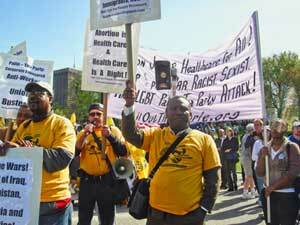 Defend Reproductive Rights, We Won’t Go Back! Hands Off our Post Offices! No Closings or Layoffs! Equal, Quality Education is a Right! Stop the Privatization of Public Education! Stop Foreclosures and Evictions! Affordable Housing for All! End Racism, Sexism, LGBT Oppression, Poverty, Budget Cuts and War! SOLIDARITY IS OUR MOST POTENT WEAPON!!! A militant movement led by women changes history! Globalize Women’s Solidarity! Every Issue is a Women’s Issue! International Working Women’s Day—March 8—has been celebrated around the world for over a century. The day commemorates protests by women garment workers in New York City against starvation pay and brutal conditions. This year also marks the 100th anniversary of the famous eight week “Bread and Roses” strike inLawrence, Massachusetts. There textile workers, a majority of them immigrant women and children, struck when their hours and pay were reduced. They won a pay increase while keeping the reduction in hours. 75 years ago women were indispensable to the great sit-down movement—not only as the spouses and family members of male autoworkers but women who worked in Detroit’s factories and department stores. Working class women today are still making history. Some are leaders in the Occupy movement and others are fighting for and winning the right to stay in their homes. Women are leaders in the immigrant rights movement. They are fighting to organize unions, defend their JOBS, protect affirmative action, fight for healthcare and stop racist legislation like the 3 Strikes Bill in MA All around the world women are resisting, from the Israeli occupation of Palestine, to the death squad dictatorships in Colombia and Honduras, to the general strikes rocking Greece. We won’t wait another century! We demand bread and roses—and jobs, peace, housing, education, equality, union wages and a whole lot more—right now! Join us in celebrating the women of the working class, who made and are still making history. Calling All Occupy4Jobs, Labor, LGBTQ, anti-War and Progressive Activists! Join the Veterans for Peace "St. Patrick's Peace Parade"
Look for the "Labor Contingent" sound truck. In 1993, the South Boston Allied War Veterans Council, sponsors of the official South Boston St. Patrick's Day parade, won a reactionary Supreme Court ruling allowing it to discriminate against and bar LGBTQ individuals and organizations, and anyone else it's private, for profit, bank-sponsored parade wishes, including veterans and unionists who are opposed to war. Through determined action and a local court offensive of its own, the Smedley D. Butler Brigade of the Veterans for Peace has won, for the second year, a permit to march the same route in South Boston on the same day. They have invited all their allies - LGBTQ organizations, Labor, the Occupy Boston movement, and progressive, peace loving people from all quarters - to join them as an alternative and challenge to the official, militaristic, bigoted Allied War Veterans Council display. Boston "Occupy 4 Jobs!" will join with the Labor Contingent and unionists from USW Local 8751, the Boston school bus drivers, UNITE HERE, SEIU, the BTU and many others. Look for the school bus drivers' sound truck. The Vets for Peace have stood with Labor and our communities in the front lines of our battles against corporate greed, discrimination and bigotry. It's time again to stand with the Vets for Peace! "Which Side Are You On!". 1 cruise missile could pay 10 teachers for a year. We need jobs, health care & education, not budget cuts, prisons and war. The national 15-city educational & fundraising Report from LIBYA tour with Cynthia McKinney is organized by International Action Center, www.IACenter.org in coordination with many antiwar and community organizations from July 7 to August 24, 2011. Boston program is in cosponsored by the International Action Center; Fanmi Lavalas Boston; Boston United National Antiwar Commitee; Minister Don Mohammad, Temple 11, Nation of Islam*;Veterans for Peace, Chapter 9, Smedley Butler Brigade; Chelsea Uniting Against the War; Women's Fightback Network, SistaCipher; Politicin' with the Sistas; United American Indians of New England, Bishop Filipe Teixeira, OFSJC, Diocese of St Francis of Assisi, CCA; Steve Gillis, VP,USW 8751 Boston School Bus Union; Ed Childs, Chief Shop Steward, UNITE-HERE local 26*, N'COBRA (Reparations), Manchester NH (*= for id only) (list in formation - to cosponsor call 617-522-6626). KEEP CHUCK TURNER OUT OF JAIL! KEEP CHUCK OUT OF JAIL! 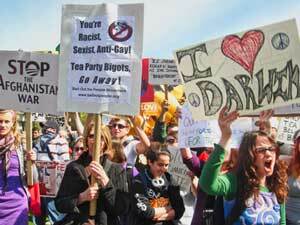 SAY NO to Racism and Anti-Islamic Bigotry on 9/11 in NYC! Sat., July 10 - 12 a.m.
NO WORKER IS ILLEGAL - LEGALIZATION NOW! initiated and endorsed by dozens of immigrant rights and social justice organizations including the Answer Coalition, the Student Immigrant Movement, the Boston Mayday Committee, the Massachusetts Immigrant and Refugee Advocacy Coalition (MIRA), Deported Diaspora, Rev. Filipe Teixeira, OFSJC, Coalition for Equal Quality Education, Bail Out the People Movement, the International Action Center, and many more. CLICK HERE TO SIGN Online petition to send messages saying NO RACIST ANTI-IMMIGRANT ARIZONA-STYLE LAWS to the Obama Administration and the Governors, Congressional Delegations and Legislatures of all states where such laws are pending! Petition: Condemn the Israeli Freedom Flotilla Massacre! Afghanistan ranks among the poorest and most underdeveloped countries in the world today. It has one of the shortest life expectancy rates, highest infant mortality rates and lowest rates of literacy.The total U.S. military budget has more than doubled from the beginning of this war in 2001 to the $680 billion budget signed by President Barack Obama Oct. 28. The U.S.
Equity & Access to a Quality Education is a Right! On May 14, 2009 approximately 200 hundred parents, students, teachers, community activists, and trade unionists held a Community Summit at Roxbury Community College to discuss and organize a fightback against the attempts by Menino and the Boston School Committee to re-segregate public schools in Boston. Called by the Coalition for Equal Quality Education this Summit announced plans for a demonstration at the Boston School Committee (26 Court St.) on June 3 at 5:30 pm to demand Equity & Access to a Quality Education is a Right! Stop the Re-Segregation of the Boston Public School System! Excellence & Equity for all students in all schools! Funding for Programs and Staff (no layoffs)! The International Action Center (IAC) was launched in 1992 by former U.S. Attorney General Ramsey Clark and many others who had worked together against the Gulf War.